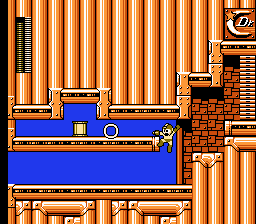 GB version of MMIV's Ring Boomerang Weapon featuring Item for Mega Man 4 NES Hack? Last view: 69 days @MikeTechno There is a reason why Matrixz's CSA editor exists. The CSA allows tiles to position the X and Y units to connect them. I am very aware about frame animations and usually I start from the feet of her tiles. Speaking of feet, I should move Roll (Standing pose) 1 pixel right so she wouldn't be floating on edges. I already noticed it while testing. 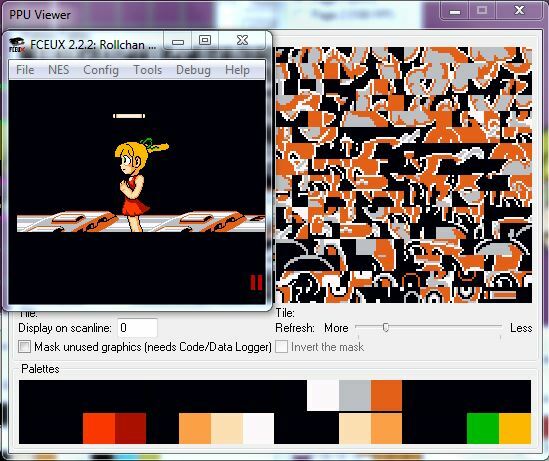 NES Roll Chan mobile is much harder than the fangames which is my greatest challenge of romhacking. @Korxroa Did you code the Ring Boomerang on your own or did you stole some reading code from Rm4MI. Just curious? Last view: 1288 days This MMIV's GB NOT Puresabe's RM4MI. Patch MMIV's GB Weapon Ring Boomerang with Move Item (E-Tank, 1up, Weapon Energy etc) in MM4? Find ROM Offset with Hex Editor? Last view: 115 days So, matrixx could continue with Mega Man Forever. This game was very promising. There's nobody interested in continuing with the project? Ps. Unfortunately I'm not a programmer. But I appreciate the service of you all. just realised I was using an old version... I am a derp.. Does anyone know how to edit this? I need to know where the flickering colors on the Intro-train scene. The palette is located at offset 36975 (both for MMIV & RM4) . Encircled 1 & 2 ; 3 & 4, where 1 & 3 are the flickering colors. Changing the values only successfully affects 2 & 4. Changing 1 & 3 from $11 & $2C to $26 & $38(or $19 for green ribbon) doesn't change at all. The face "flickers" too. 39 is the lit up front-of-the-face part. Opened the hex editor and searched for "0F3B01" in the RAM. That took me to offset x0612. I watched it and saw $3B<-->$11 (colors changed with it). I set a write breakpoint at $0612. I set my condition like this: "X == #3B || Y == #3B || A == #3B"
I needed to find the last place A was loaded from, so I plugged $950B into the Seek To button and got the ROM address. Then I started messing around with the hex values to see if it changed them. Switch your object type from "Enemies" to "Items". 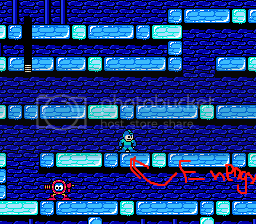 Then click Remove after you select it..
EDit:Welp I found how but I was tinkering Heatman a bit and now he is how I want hm to be but I found a bug wish I dont know how to fix it , the thing is when Im in contact with an immobile object or enemy it does like if they where not there ! Im sorry if I am being annoying ..
EDIT2:nvm, thank god I made a backup.. I like to borrow a few when you complete this. 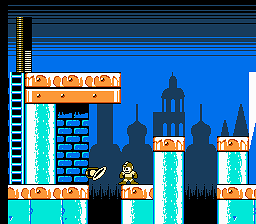 But for now I am making a clean port with only the sprite change. I figured out, kind of, how to "enable" the buster shot for charge kick in MM5. x037580 has all of the different pointers(?) for the weapons. If I set the low/high pointers for charge kick (x037589/x037599) to the same ones as the mega buster (x037581/x037591) I can get MM to shoot while he's got charge kick equipped. But the bullet travels through enemies, and I don't know how to fix that. So I've hit a roadblock. Long story short, there's no on/off switch for properly enabling the Megabuster while equipped with Charge Kick. The face "flickers" too. 39 is the lit up front-of-the-face part. Opened the hex editor and searched for "0F3B01" in the RAM. That took me to offset x0612. I watched it and saw $3B<-->$11 (colors changed with it). I set a write breakpoint at $0612. Sweet, thanks, man! Now I got her with shadows on her dress, except on her hair b/c of the green & yellow paired up. Off the top of my head I'm thinking that since the Megabuster and Charge Kick are treated a separate weapons what you'd need to do is alter the Charge Kick code to jump over to the Megabuster code before it reaches it's RTS. However, this is dependent on if the two routines use any specific values to work or not. If they don't require any registers to be set before jumping to them then it should work. Also taking into account any need for free space, you may need to relocate the Charge Kick code as well. Find the jump to the Charge Kick code. Copy the original charge Kick routine to a new location. Add in a jump to the Megabuster code at the start of the old Charge Kick routine. Add a second jump to the new Charge Kick routine. NOP the rest of the old Charge Kick routine and take note of this remaining space for future use. It might work kind of like that. Based on those weapon pointers I found, the Megabuster is definitely its own attack routine, and I can swap any of the other attacks with that one and it works fine. Charge Kick is actually just a RTS. I think the actual charge kick attack is coded into the regular slide routine. If Charge Kick isn't equipped, that part of the code--the part that makes MM invulnerable and causes damage--is just branched over. Assembly Document (doc not txt) for Mega Man 4? with download link? unlike RM4MI's stop Ring Boomerang move use D-Pad and press holding B button or Moved Item. 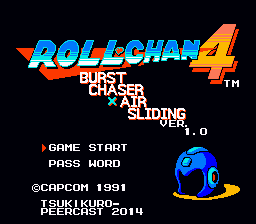 A new hack, Rockman 4 Burst Chaser x Air Sliding was released! You can download it from a link below. I dunno, dude. Charge Kick is a pretty underwhelming weapon. I don't think allowing the use of the Megabuster would make much of a difference, that is unless in this circumstance the Megabuster part would be counted as Charge Kick damage. That's something I hadn't considered before. Having it go off with "B" is a great idea regardless. One of the biggest annoyances with that ability is that you can't use your normal slide without wasting weapon energy. Here's a radical idea, change it so it doesn't use the slide animation at all. 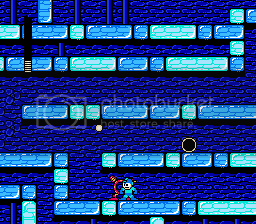 Have it use the throw animation or if possible add in the "Break Dash" animation from Megaman V (GB). Then make it so it can be used in mid air and you'll have a vastly superior version of Charge Kick that doubles as a limited air dash ability; "Charge Tackle". Also, time to test Roll-chan 4 compatibility. Ugh, aside from buggy intro animation, player sprites are okay though. 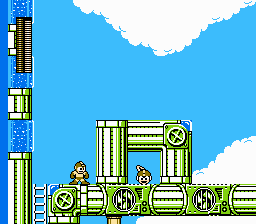 My favorite childhood game, Mega Man IV before I found out of Japanese counterparts. I kinda saw it coming from Tsuki. I wonder if is good but not better than Rm4MI. 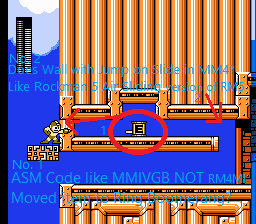 I hadn't actually thought to make MM do a regular slide with A+down until you just mentioned that. Thanks! I'm going to make that work. And I've actually got a Break Dash-kinda thing going now (complete with airslide). There are one or two more things I want to modify with Charge Kick before I'm done... 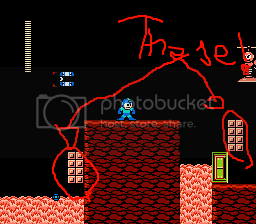 I'm thinking MMX dash-jump, and maybe some kind of reflect bullets thing. Anyway, thanks again for the ideas! I think once I get a bit more to show I'll start a thread with my progress. Oh, and without looking too hard, when shooting the megabuster, equipped with charge kick,  the damage dealt is based off of charge kick's vulnerability "set", but that could probably be easily rerouted. MySQL - queries: 131, rows: 172/0, time: 0.169 seconds.